This past weekend I had two articles published that readers might appreciate. In How to Spend It, the latest installment of my ‘Inside Track’ column looked at the cloth development process at Charvet, with an interview with the lovely Jean-Claude Colban. Read it to find out about trends in whites and blind dyers in Aleppo. A full version of the interview will be published on the blog on Boxing Day. And in the Financial Times, I was asked to write about the variation in shirts for black tie. It’s a crying shame that so many men wear plain shirts with their tuxes these days, without a stud or pleat in sight. The column won’t teach much to regular readers of this blog, but they will learn how Karl Lagerfeld commissions his new shirt designs from Hilditch & Key in Paris. You can follow the discussion on The perfect white shirt, and dress shirt variations by entering your email address in the box below. You will then receive an email every time a new comment is added. These will also contain a link to a page where you can stop the alerts, and remove all of your related data from the site. 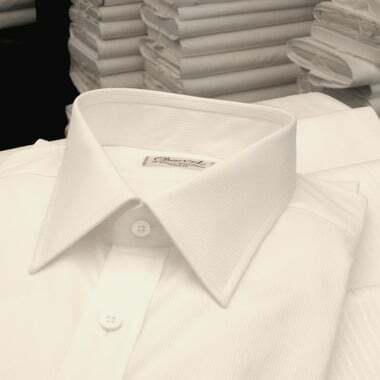 Any idea of the cost of Charvet shirts? I’ve a conundrum when it comes to white shirts. I’d like to wear them without any undershirt (though I must admit I find an undershirt cooler and in some ways more comfortable) as I feel it looks best without – however I’m also not a fan of sheerness and for those of us with some chest hair that’s an issue. What material/weight is best to avoid such a display? It’s hard to specify as, in the same way as suitings, there are a lot of variables – fibre, yarn, weave, weight, finish etc. Thank you. I may have asked this in another post but can you recommend any shirtmakers who have no minimum on bespoke first orders in London? I know of GuyField but have no experience of them. I do recall your saying once that Simone Abbarchi does bespoke with no minimum ( I may be misremembering) and that he makes a visit to London twice a year? Aside from him and assuming there is no one who is London based that operates in this way, and taking into account the many variables that determine one’s personal preferences, is there someone here you can recommend to one looking to have their first bespoke shirt made with budget in mind? I’m sorry, I thought you meant just London-based people. Yes, Simone is a good option. It’s I who am being unclear. London-based is certainly the preference here. I only mentioned Simone as that could be an alternative if there’s simply no one here I can go to but if we put the “no – minimum” requirement to the side, is there someone in London you’d recommend for someone having their first bespoke shirt made who also must consider cost? Sean O’Flynn in Sackville Street does not require a minimum, you can start with 1 shirt. It’s a while ago I used him, though, so not 100% sure if it’s still the case.